Later topic: Columbian Mfg. Co.
My name is Bill White and here’s my own home built press which I call the Studio-Platen 6 x 9. This small table top hand operated machine was born out of our necessity to have precision letterpress capabilities at home in our small 2nd story apartment, thus the “studio” designation. The press is divided into 2 main parts: the platen/bed assembly and the removable impression lever. This is a stationary platen type press with an inverted bed currently equipped with a 6x9 deep relief Boxcar base. 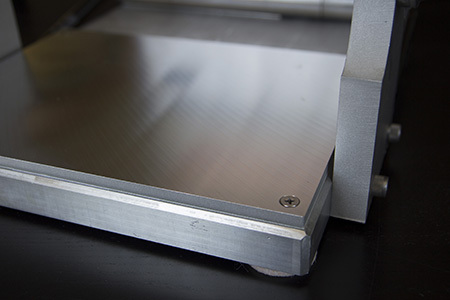 The platen/bed assembly opens with the assistance of gas springs to allow easy inking and paper placement. The impression lever assembly contains the components which, when latched into the platen journals, provide efficient force of impression through mechanical expansion. My design was inspired by the Washington style toggle press. But instead of using a toggle I’m using 2 small cranks and 2 roller segments. 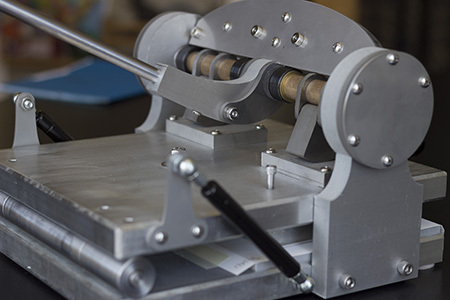 When the form is inked and closed onto the paper, and the lever inserted, the only remaining distance to be covered is that needed to press the form into the paper. 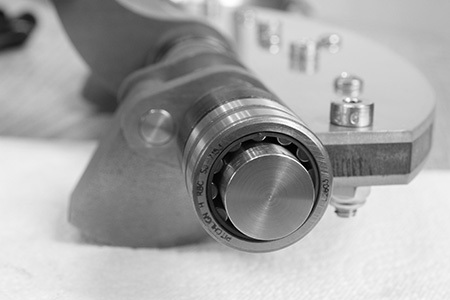 At this point, the lever’s crank/roller assemblies come to rest at 15-20 degrees behind maximum stroke and when pushed home, the resultant expansion covers only about 3/32” distance. So in parallel with the Washington design, great mechanical advantage is at work. Construction: The platen/bed plates are made from 1” 6061 extruded aluminum, further machined to assure basic, flat working surfaces. 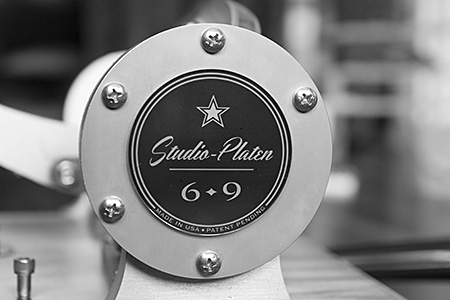 The Boxcar base as well as the .25” platen work plate are both made from MIC-6 cast tool plate. The side journals are made from .75” 6061 and further reinforced with .25” steel and .125” S.S. caps. At the core of the impression lever is a .75” case-hardened S.S. Shaft integrated with a fixed steel arched beam which follows the load and prevents the assembly from flexing throughout its working arc. The lever assembly’s vital components are made of steel with the exception of the center yoke which is 6061. The handle is .5” hardened SS, 18” long with a 1.5” chrome plated ball on the end. Bearings: For the impression lever main shaft, high load roller bearings are used at each end. For the crank/roller assemblies, .375” hardened steel crank pins, lubricated with 20w50 synthetic motor oil. The press with lever weighs about 55 lbs. The footprint is 11” x 13”. We have completed about a dozen jobs with the S.P. 6 x 9 and half of those were tests. All went well. Nice. A modern take on the parlor press. Wow! Amazing bit of machinery ya made there. Can’t stop watching the video! There is something about immaculately designed, precisely machined parts moving in unison. Though, I fear, taking the lever off/on for each impression might get a bit tiresome. What an awkwardly effective machine. I thought Adana QH presses were slow, but this one takes the prize. Excellent, a modern take on the ancient swing lever presses. Like all things crafty, this beautiful machine is a dream to watch. The extra movements of Impression handle removal are no more distracting than the lifting of friskets/grippers. The ability to print more than one up is clever. I think that printing 500 of anything would be very tiring with a machine like this. Reversing the position of the traditional parlor press set-up - block on the platen, paper on the bed - I don’t think is an improvement. It makes the inking difficult, accessible, but difficult. The detachable impression device seems to be effective, but again, it is awkward and by the looks of it rather heavy. There is no mechanism with which to adjust the tilt of the bed to the platen, and the only mechanism that I can see to adjust for paper thickness is whatever is placed on the surface of the platen. With all of the practicable printing press designs available, I just can’t understand what led up to this configuration other than the need to be different. Hi, Inking is easy. Pulling an impression is quick, efficient and very satisfying. The press is also easily adjustable to accommodate just about any plate thickness/paper combination and it’s not achieved through piling layers of paper on the platen. The handle weighs about 8 lbs but I don’t seem to mind. As far a speed goes …I don’t know what to say because it is a fully manual press. I went slow for the video so maybe it appears to be more laborious than it actually is. My main goal was to make a press that could deliver great printing performance yet remain portable; I feel that I’ve succeeded to that end and yes, I was partly driven by the need to be different …aren’t we all? Thanks for watching my video. I’ll post more soon. Each to his, or her own. With a shop full of hand-operated presses, and a long history with many other kinds, the only redeemable thing I see from your press is that it can transfer an image. It is slow, cumbersome, and having to lift an eight pound piece into position for every impression would certainly be tiring - to say nothing of the heavy ink roller. I don’t know whether you made it for fun, or as a marketable item, but I for one am not impressed. I can live with that. Thanks again for taking the time to watch the video and comment. Bill…. what a great press! Your craftsmanship is superb, and looking at the design, it is obvious that you put a lot of thought into it. Making a press from scratch is not an easy task. Most folks have no idea what it takes to design and build one. I’ve built a number of different machines myself, (but never an all-metal one like yours)….and from one press-builder to another, I can tell you that I’m impressed! W.C.P., It would be neglectful of me to not mention a home-built platen press design that I have admired for years …your own twin-screw Handpress. http://briarpress.org/13002 That thing is the bomb! Interesting approach to printing, and superb execution of the completed press; the details of finish exhibit true craftsmanship. Would that more folks would /could use their head for more than a hat rack. As for the ‘unimpressed’ fellow, well, not to burst his out-sized vanity (perhaps he will share some of his projects for viewing? ), but I really don’t believe you had his applause as driving force behind your project. :o) Well done! forme, Thank you kindly. This is a season of good cheer and understanding. Peace to all! To each his own indeed, in fact I’d put forth that this is exactly the point of a project like this. It might not be fast, but seemingly it fits your needs perfectly. And I’m sure it is very satisfying to have built a press that fits your specific use-case from scratch and have it provide a solid result. Luckily there are still people in this world who want to make things rather than buy stuff off the shelf. kimaboe, Thanks. Yes, it has been very satisfying to conceive of, create and use this press. Billy- just as an added query- how much did it actually cost you to build this? H.P., For the materials and services required for my last iteration I’d have to add everything up, which I haven’t done, but it wasn’t cheap. If someone was interested in having a duplicate of the S.P. 6x9 made, I could provide a price, but it would require exploration of past receipts and anticipated labor time. It would be expensive, but I could and would be happy to supply a capable, powerful and fun printing machine in exchange. I have applied for a provisional patent, as a precaution against outright public theft. Outside of that, I have made no strategy for marketing any duplicates. Bill, From one who is doing fairly well re-manufacturing parts for table top presses, Brilliant execution, from an Engineering point of view. One query, why did you choose to invert your system compared to the Quarto Adana style, i.e. Type or Image on the Bed down-hand & Platen, Frisket etc above. It is well documented that the Vertical Miehle, being completely vertical & with the Bed and the Cylinder working in opposition, all and every lock up has to be 100% plus.! Appears that you made your Brilliant execution just that little bit harder. Perhaps you were only ever envisaging working from solid mounting base, One Piece etc. Understand your possible application for Patent rights, but one would think that if any Individual OR Company thinks to Plagerise your system it would cost so much to reproduce from scratch, commercially, as to make it Un-viable. If Patent Application charges are anything like those in the U.K. we wish you good luck. Is it possible to think in terms of “One piece Magnetic Base” and running with Steel backed Photopolymer Plates.? Fairly well documented. I use a Colchester Bantam Centre Lathe & Kearney and Trecker, Universal Milling Machine, but one of my favourite instruments is the MAGNETIC Base that carries the “clock” and “dial” gauges, when checking for accuracy, turning and milling etc. The magnetic base has Lock/unlock facilities. I offer this against the background of Posts some time back on B.P. whereby a new Devotee was struggling with the problem of removing or repositioning, steel backed P/P, plates from the magnetic base, 2 opposing bases apparently solved the problem, but one had to be borrowed/lent etc. Releasable base was produced mid 70,s ish but even at 1/2 forme area for British Thompson Platen size, (slightly bigger than 10 x 15, H/berg) proved TOO expensive. Bill, again Brilliant Engineering, but is your Equipment on restricted information list? or have you got access somehow to a C.N.C. Machine.?? Good Luck. Mick, I know that it seems silly to even mention a patent for something that 99% of consumers can’t even use, and of course, you’re right - no one with any common sense would copy such a thing with the hope of selling any. Heck, I consider myself stupid for spending as much time on it as I did, but I couldn’t help it! Provisional patents are $65.00 for the first year, after that one must continue with the full patent which costs a whole lot more! The reason I inverted the press was to completely eliminate paper travel, thus insuring absolute registration and minimal handling. You’re right about Miehle verticals being scary …and I’m sure there have been many really disastrous spills and crashes but most can be attributed to poor lock-up. If one knows what he or she is doing, there should be no problem hanging a conventional chase upside down, but depending on how much lead is involved, you might need to switch out the gas springs with ones of higher strength. Besides that, what could go wrong?! Magnetic bases are really nice but it’s not something that I need …I’m happy going slow. It sounds like you have some wonderful machining equipment, I have only a small lathe and drill press. Thanks for the positive compliments, but I must ask, what is a “restricted information list”? Bill, It is nice to converse with somebody who is on the same wavelength, because they have actually created that which they are speaking of. My restricted info comment was based on the principle of, i.e. keeping your cards close to your chest, to protect your methods and equipment, but as I implied, it was obviously a labour of love and a lot of Brain Work. I quote an actual example, My Dad learned the hard way in 1951/52… . He constructed and perfected a working model for the Dispersal and Flow of (Apologies for Unsavoury content) Effluent from household waste liquids. He could not afford to pay the U.K. Patent fee. My other comment is based on the finish and appearance of the machining on your S P 6902.jpg, shot,! Did you work in Imperial OR Metric,? . . Your pictured Bearing looks like very substantial Twin Track roller bearing, rather than conventional Ball race. With my Colchester Bantam centre lathe, the only way I could get close, and as you have already stated what material you are working with, I can “Turn” my stock at the correct speed, for the finish, on auto feed, but have to use bribery and corruption, in the Machine Shop of my Local University, trying to learn how to grind Carbide/Tungsten tipped tools.? . . .Hence my, C.N.C. M/c. comment. Again Good Luck if you go for Patent rights, ***What the crafty B*****s do here is make one or two smaller modifications to the original and then ride “Rough Shod” over the One that did all the Hard work.! Mick, I think it’s too late to keep my cards close to my chest since I discussed, in pretty good detail, many of the materials and dimensions in a previous post, but it was intentional and if anything, I hope to encourage others to make home-built presses too. I have no formal technical training but have a good background in DIY engineering; I can use a calculator, paper & pencil, a protractor and a ruler. I also know how to use the telephone & email when I need to learn more or have something made. I’ve also been a printer for many years and am very familiar with all types of impression mechanisms …this helped more than anything. By the way, I didn’t use CNC. I used waterjet: http://www.tritonwaterjet.com/ which is less costly if you only need 2-d cuts. Billy- thanks for the thumbs up on the twin-screw press. That’s one of the reasons I built it: to help inspire other builders. just fyi: the press is still regular in use, printing quarto broadsides with lino-cut illustrations. It has acquired a nice golden-brown and ink stained patina that gives it a rather “antique” appearance. Paul, With all due respect sir, do you have something positive to add? I noticed how you started another thread so as to avoid comments I made earlier. I am not sure why you think that I have to add something nice (insert interrobang here). When you posted it on this site and invited criticism did you not expect any? As for all the ego stroking for which you are asking, I still think it is a crappy design that is not practical. I even went to the trouble of showing your video to my wife and daughter who are not printers, but have been around it for about thirty years, and seen many different printing presses pass through my hands. Their comments were not as diplomatic as mine. My wife called it a tortilla press, and my daughter was even less generous. The machining seemed nice, though. You might consider actually listening to people who have experience with printing presses. But I get the impression that you were more interested in the process of making it, than the actual outcome of a practical printing press. You should have made two of them. While my kluge is “the” press, my future labor force (7 grandkids oldest 7) are not quite ready for it.I think this device would be a great way to get them started without their parents worrying about me returning them intact. So come up with some numbers. I’m not sure exactly what your issue with this press is, Paul? Nor why your tone is so dismissive. You say you are not impressed and that it is not adding anything new? It is producing a great looking 6x9 print and takes up a fraction of the space at a fraction of the weight of any other press I’ve seen that have a comparable print size. What exactly is the problem? Edit: his two threads, one about the press and one about the full-chase test, made perfect sense to me and I have no clue how you’d intuit that this was somehow done to avoid criticism. DTP… while we all understand that you don’t care for Billy’s design, are all the negative waves really necessary? Personally, I’ve been in the letterpress / intaglio field since the late 1960’s… and I think Billy’s machine is one of the best I’ve seen in a number of years. DTP, I built this press to meet my own high standards, not yours. This is a simple show and tell time …and that’s it. I had no need for council during the conception and build of this project. I knew clearly what I wanted. I have to tell you honestly, you lost all credibility as an expert the moment you dismissed my efforts and denigrated my art. Now I’ll remember you mostly as being socially crude. Sorry to say it. Your working “Studio” press is an outstanding accomplishment. Your needs were clearly stated and met, perhaps even better than with what exists. Your execution, while only a few people on this list can truly understand, shows a creative mind combined with skills that I find being lost in todays world. Surely you devoted innumerable, untold waking and sleeping the hours to each step of its’ development. Your creation embodies such a different aspect than the historical collection, restoration, and preservation that I work from. Yours may not employ improvements over existing designs but your execution towards it’s build is to be commended. Comparisons are unfair, but I see in your press some similarities to a Seal Dry Mount Heat Press, used by many photographers and framers. May I suggest you get a hands on look at one. It might trigger some additional ideas, although your press goes way beyond. Even though you have completed this press something tells me that you will always be thinking of refinements. At 64, I now see that one of my (tool & die maker) father’s greatest gifts to me was a similar mindset towards precision and skills to operate a lathe, and some other less complicated pieces of machinery. Perhaps you are planting similar seeds with your children or other people in your life. In my opinion, your post has been “out of the norm” for this site and very refreshing in a positive way. Thank you. BB, Thank you. My father was a successful engineer earning several patents over the span of his career. He continually encouraged me to create and think outside of frozen concepts and ideas. I am attempting to pass this along to my 8yo son. It’s valuable. Ted, I’ll try to come up with some numbers but it won’t be until after New Years some time. Thanks! I don’t feel it is necessary to pat someone on the head for a poor design. And I don’t appreciate the pile-on by others who seem to be impressed with a shiny new tool. If you imagine having to lift an 8 pound handle twice for every impression, along with a 6 to 8 pound roller (and suggesting that it would be a good thing for kids to do), then you might understand why it is an impractical design. Billy says that he is a big guy, and it’s no trouble, but think of a 75 pound kid doing it, or a 110 pound woman, and you are asking for repetitive stress injuries. I know that I would not care to do it. You could get a decent impression with a rock, but that doesn’t mean that it makes a good printing press. When I look at a printing press, I look at the ease of operation compared to the output of my own energy, and since all I have are hand-presses it is something I look at very closely. I don’t see any ease of operation here. I see a poor inking set-up, a heavy detachable impression mechanism, and none of the adjustments that I would like to have to facilitate makeready. It is totally impractical for moveable type, but it isn’t rigged up for that anyway. So at what point will you all realize that the king isn’t wearing any clothes? Over the years, Paul of DTP has made significant contributions to the letterpress community: sharing his knowledge and experience with all, for free. I know of few who have shared more and I thank him for it. (Fritz Klinke has share a great deal as well). In this post, Paul has shared a realistic view of this press as something a professional printer might use to pay the rent - this press might be substitute for the toy letterpress you can buy at Hobby Lobby and an alternative for those who chase Kelsey’s on Ebay (and I bought one there), but it does not appear to be a press that someone could make a living with and I think that is Paul’s point; you are not going to use this press all day to print for a paying customer. Might have been fun to engineer and make, fun to use for hobby printers who don’t want to, or can’t afford to, invest in a “real’ commercially viable press. It’s a good thing DTP wasn’t there during Gutenberg’s printing of the bible. That press too was impractical borrowing as it did from a simple wine press design. A design so poorly conceived and executed that its principle lasted a mere700+ years. That design was certainly heavy and ungainly, difficult of ease, frustrating in inking method and demanded great strength to effect impression.Yet, somehow, it spread knowledge through the centuries. Yes, where would the Black Art be if some pouty, whinging naysayer had his way in the mid 1400s? I see you are true to forme - as in those who have nothing to say will endlessly repeat it. Considering that Gutenberg (or whomever initially came up with the idea) was working with a new idea that didn’t have a nearly 600 year history preceding it, I’d have to say he did a remarkable job. To assume that it survived in that form for so many years is ridiculous, and since we have no idea what form it originally had, it is a specious argument. I’ve never claimed engineering skills, but I have been able to improve the performance of presses I have owned, but that was from using common sense, and 43 years of experience. I’ve never been afraid of enlisting the skills of people who are better at their trades (machinists, welders, etc.) to aid me in my efforts. Valid observations are not whining, they are a sign of critical thinking. Unlike so many sheep, I choose to voice my criticism when and where I think I will help in particular situations. This is one of those times. I hope that, if this machine were offered for sale, that someone might benefit from my observations, and not be stuck with an expensive and difficult to operate press. I would have thought that it’s maker would have looked at the long history of printing presses, and come up with a better design. If or when he does I would happily throw my support behind him. I did not personally attack Billy, but confined my observations to his project. That he and others find it necessary to personally attack me is unfortunate. I have not been critical of his machining or his finish work. My comments have been solely confined to the mechanics of his press. I don’t know Billy, and I’m sure his intentions were good. I don’t judge him to be a bad person. I do think he should have consulted with some knowledgable printers before completing this design. The history of printing is littered with the carcasses of poorly designed presses, I have a few on my shelves. I don’t understand why, with literally hundreds of expired patents from which to build upon, that it couldn’t have had a more printer-friendly design. I’m not trying to pile on you, Paul. After all, where would we be if it weren’t for the veterans who’ve shared their knowledge, experience and advice on BP? Yet I see no reason to quickly express opinions in such a dismissive way, based on a purpose this press never meant to serve. The goals of the project is made quite clear, the press meets them, produces good work… and it was never intended to be marketed or sold. You made some suggestions of ways to improve the press. Sometimes advice is taken to heart and implemented, sometimes not. It happens, no need to get personal on either end. But, history shows us that Briarpress contains all manner of people and it is clear that a significant portion are hobbyists with no intent to make money and no room for a large press. They just want to print some things for themselves, friends and family. Realistically, many of them would are better served by a small, lightweight press that allows them to print 100 christmas cards and can be stowed away easily, than they would by trying to fit a Pilot in their kitchen. Presses that fit this description are hard to come by, illustrated by how an Adana Quarto can fetch two grand on eBay while a floor model C&P can often be had for a song and the effort of getting it out of a basement. At the end of the day, I guess I’m of the opinion that working a bit harder for slightly longer and printing 50 cards is preferable to not having a press and not printing anything. The hobbyists keep businesses going and services available. And when a lot of those people eventually graduate from their small tabletops and polymer plates, embarking on the life-long process of learning how to become printers, it’ll be mostly thanks to the generous advice given by veterans, even if it takes a while to grab hold. forme - Are your attacks really necessary? I have not maligned anyone. I have called no one names. I pointed out problems I see with the press which were actually echoed by others, yet there is no backlash against them. I have expressed my opinion, and if no one wishes to listen that’s fine. If it ever came on the market I doubt that any of you would spend the monies it would cost for manufacture anyway. Interesting how you attempt to reframe the debate thereby positioning yourself as the aggrieved.. There has never been an accusation of you deliberately maligning anyone, rather, the discussion centers around your deriding Billy White’s outstanding press. You might well have reservations as to the press viability, but dismissing his effort with contemptuous remarks has no place in any setting. Presses, as people, differ; each having purpose suited to circumstance. Mr. White knows full well his press in no way competes with others - it is of his design, suited to his purpose, and fills a need he alone saw fit to fill. Perhaps, had you even a modicum of understanding purpose-driven goals, you might have framed your criticisms with more reserve. As it transpired, you simply cast his press aside without any consideration for some (or any) of the aforementioned conditions. That, Sir, is the mark of a pretentious boor. Oh my God! What have I done ? ! Paul, I am sorry that I called you socially crude, I take it back. I’m sincere and it was a mistake…but you called my design “crappy” and I took it kind of personal; I worked a long time on my little press. I have been reading here at B.P. for years and I’m aware of your experience and knowledge …and your fine collection of antique hand presses down there at your shop in Santa Cruz …and your valuable contributions to the letterpress community. You have my respect there. If you are indeed a true conservator of the history and science of printing, may I suggest that you not try to squelch innovation? The reason I ask this is because new ideas (not necessarily mine) might actually become part of printing history through the care of people like you. That being said, would it be prudent for someone in your position to encourage new ideas, however undeveloped and impractical they may currently be ? Since I’m not willing to scrap my invention in favor of copying a previous design, do you have any suggestions for making my press better? The basic machine is compact, lightweight, parallel, accurate, mechanically efficient and very powerful. How would you suggest I make it more user-friendly? Are you interested in thinking about how to deal with the 8lb lever? unfortunately, It needs to be that heavy to exert its large effort. Someone here suggested a swing-away mechanism to eliminate the hoisting in & out of the weighty device. I’m open to more ideas. By the way, the large capacity 10” brayer, which affords the delivery of an even ink film across the entire 6x9 form with no depletion or repeating, weighs a scant 2 1/2 lbs. Peace, and again, I’m sorry for what I said. I had given Briar Press another try since the last time people decided to pile-on over me expressing my position, and voicing my opinions. One of the real problems in our society is the lack of critical thinking, and apparently insulting people is now more important than actually reading for information, and then thinking about what has been written. I’m tired of it. I’m tired of listening to the tales of woe when wannabe printers buy presses they don’t understand, and then promptly break them. I’m tired of the neophytes who think it is their right to claim that they are saving letterpress, and malign the people who have done it longer than they have been alive, who, if they hadn’t done what they did to save letterpress there wouldn’t be as much left as there is. You people don’t want to learn a trade, or a skill, you want instant gratification, and then to have your ego stroked over a piece of printing that looks for all the world like the first stage of make-ready, or POS Kelsey painted metallic pink. No need to even mention the crash printing crowd -how is that working out on your 3”x5” press? I’m no longer interested in what Briar Press has become. The best printers that were on here years ago have left because there are a some who would rather pick fights than share information. I don’t wish to attempt to share information with people who are either not willing to listen, or so damn smart they don’t think that they could learn anything from ‘old-timers’. I think that there are more than enough experts on Briar Press. As apparently do you. My father said, especially when in youth I was doing something ‘my way’, he’d say,”You know, you don’t have to re-invent the wheel.” There is a wealth of information out there about printing, about inks, about presses, about papers. For all that has been lost in letterpress there is still a lot left to work with. Read a book, look at an old trade magazine, maybe even break down and listen to an old printer. You might actually learn something. F.A.O. He who speaks with “Forked T*****?T***?? ?” Any updated research, on good old fashioned printing machine rollers, that have different size trucks in relation to the diameter of the compound.?????? . ZZZzzzzzzzzzzz. C’mon man! I’m a printer too! I just got back a few hours ago from my printing job in Napa. I was just apologizing and asking for ideas. Listen DTP/Paul, for criticism to be constructive, one must provide both a + and a - ; one must be contributing and and making suggestions. It’s just not that evident in most of your posts; you are difficult to read, difficult to see as not being high and mighty. Some people here might be questioning your experience, but you seem to take it as if ALL are doing so; and taking personally people’s reactions to what they view as INSULTING in your comments. Maybe his press could be better designed, as could MOST OF THE DEVICES WE CAN PRINT ON. They can be continually improved; that is why it is a tradition. But perhaps you would do better to exhibit a bit of tact and contribute to an individual instead of bashing, because when you bash you come off just about as sour and ill tempered as your last ranty post about how much it stinks around here indicates. You don’t have to say anything nice; but if you claim to be constructive, you have to actually want to be constructive and have to contribute both sides of the coin, man. Yet again DTP attempts to divert attentions from his original naysayings. It might well come as shock, but your generalized lashing out merely cements your image as poseur. You once departed BP in a huff; that few bow to your assumed superiority, together with your thinly-veiled threat to once more pick up your marbles and depart from this forum of incompetents, points yet again to your thin-skinned sensibilities. Damning someones’ efforts, then crying ‘Foul’! when called for it, tells much of your character. And no amount of (supposed) years in the print field can correct that failing. Go. Go with God, and hopefully you will find that which you seek. Billy, I have a suggestion on this. Overall, I really like this little press, but I have to admit I can see Paul’s point about lifting off the impression mechanism on every pass. What about mounting it on a pintle? Basically, mount a vertical pivot on one cheek of the press, and have a latch on the other. It could be as simple as a 1” steel rod, threaded on the top to take a couple of nuts, with an oil-bronze bushing between the pintle and the impression mechanism arm. To work the press, one would unlatch, swing the impression mechanism away, open the bed, ink the forme, close the bed, swing the mechanism back, latch, and print. This would be no slower than the current method and keep the press operator from having to lift the mechanism. Mephits, Thanks. I’m thinking about something pretty much just like that. It seems like it could be simple and do-able. Oh yeah, HP gets credit for starting me thinking that way. Should be simple enough. My thinking is mount the pintle offsides from one of the cheeks. Make a C-shaped cutout in that cheek (I think this would basically mean removing the outer plate), then let the mechanism swing into that C and into the socket on the other cheek. That way the pintle doesn’t have to take the printing pressure, the cheeks can. Plus it may not require quite so much modification of the existing machine. The only problem that comes immediately to mind is that the cut-away cheek may require extra reinforcement as it would no longer have the solid plate on the outside. This might be dealt with fairly simply by putting a latch on the pintle-side cheek that connects the top of the cutout to the bottom of the cutout and simultaneously holds the mechanism in place. Hmmmm. I’m going to have to pull the little press out, open a beer and take a good look to see what’s what. I think I’m going to try to make this happen soon …it’s a good idea. I can’t find out how to delete a post so this content is pure fluff. Did you forget about Freedom of Speech? Or is that only for a select few?!? The problem with opinions is we all have one and sometimes it makes people MAD or upsets them…should we behead those we don’t agree with? In keeping with the tradition of letterpress printing, in its ongoing and evolutionary form (as I see it), I will post new videos in new threads here at Briar Press as they become finished and presentable. The next test will feature the ever popular art (sport) of deep impression printing; a task for which the S.P. 6x9 press seems well suited. Stay tuned. Girl with a Kluge, Mamma told you not to come! That’s not the way to have fun …no! 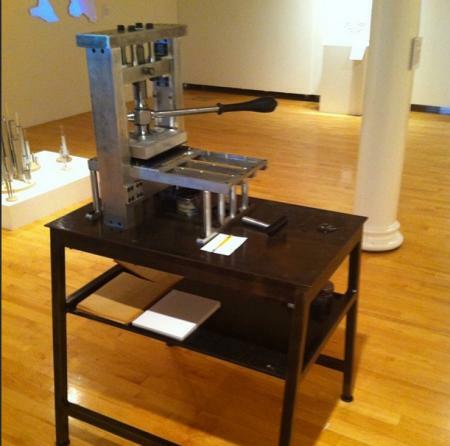 Saul Schisler, a student at the Pratt Institute here in New York recently built a small tabletop press. He did a lot of research on things that had been done before and was eager to use his machining skills for this project. He got his hands on a copy of Elizabeth Harris’ 2 volume book on the common press and made a pretty impressive little tabletop machine based on that mechanism. No doubt it is slow and inefficient, but efficiency sometimes isn’t the point. Thank you for your thread. It is one of the longest I can remember. Many comments. Some germane and a contribution to the craft. A while back I suggested that a new press should be created for those who wish to do smash printing. It would save wear and breakage of the old equipment. Your press and that of Mr. Schisler appear to fill the bill. Few or none would argue that a press to do smash printing need be speedy. Look at that! I’ll bet it works as good as it looks too. Nice work Saul Schisler! Thanks inky! We went to a party last night and I had to look for a shirt that DIDN’T have ink on it. I have devised an efficient mechanism to serve as a swing-away carriage for the 8 pound impression lever assembly. This was a valuable suggestion and reminded me of how I did end up with a slightly sore back a few times. This accessory will eliminate all of my lifting in/out of the lever during press runs. I’ll begin fabrication after the holidays and present another show-n-tell on a separate thread as soon as I’m done. I am grateful for this suggestion, Thank you. Beautiful piece of fabrication. I have built some add ons to make an old Vandercook produce some quality work using aluminium and when I saw your post with the little press I was really quite taken by the craftsmanship. Beautiful job and thanks for showing it. That’s quite a build, and a piece of fine art in it’s own right. The Owner needed something to print with and If I read his post right, it’s also a space issue for him. And the press prints what he needs. The Pratt one looks like it prints too, so what is the Beef with it? Thanks to many of you newcomers, certain Printing presses like Vandercooks and small Table Tops have reached Prices which push normal people with regular income right out of the market. Instead of critic etc. Why not applaud an accomplishment to finding a solution to a problem. Adept, over come and move on. Thanks Typenut, it really does print well, odd looking though it may be, and I’m super happy with it.